The past always offers up opportunities for valuable discovery. In an era of rampant heritage crime, we must actively build methods for extracting maximal meaning from vulnerable historical resources. New digital tools are available to expedite this, but the main work consists of active seeing (pattern recognition), informed comparison and a strong desire to add to what is already known about subjects being studied. We have a proven record finding interesting information about things which many scholars simply take for granted. Our success comes from a broadness of vision and an encyclopaedic understanding of archaeological data based on field work and archival materials in our tool kit, including a wide variety of historic photographs, lantern slides and engravings of archaeological subjects. Our willingness to "dig deeper" allows us to excite the imagination of audiences while ensuring the accuracy and relevance of our findings. Our research methods are harnessed to the idea that it is indeed possible to recreate the vanished past, and moreover, that in these times, it is encumbent upon cultural institutions to develop strategies to expand knowledge through the creative exploration of historic images. 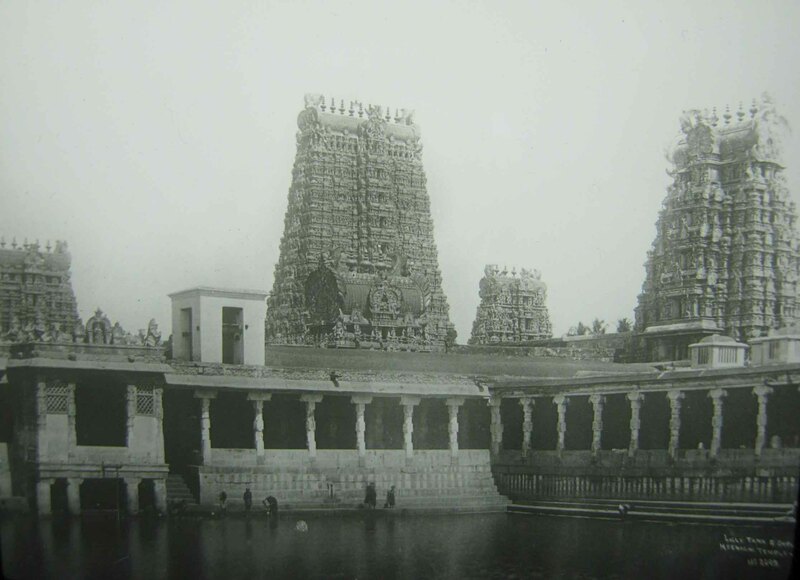 Lotus Tank, Minakshi Temple, Madurai (Tamil Nadu, India), by Edward Van Altena ©Copyright 2015 AMSC Research, LLC. 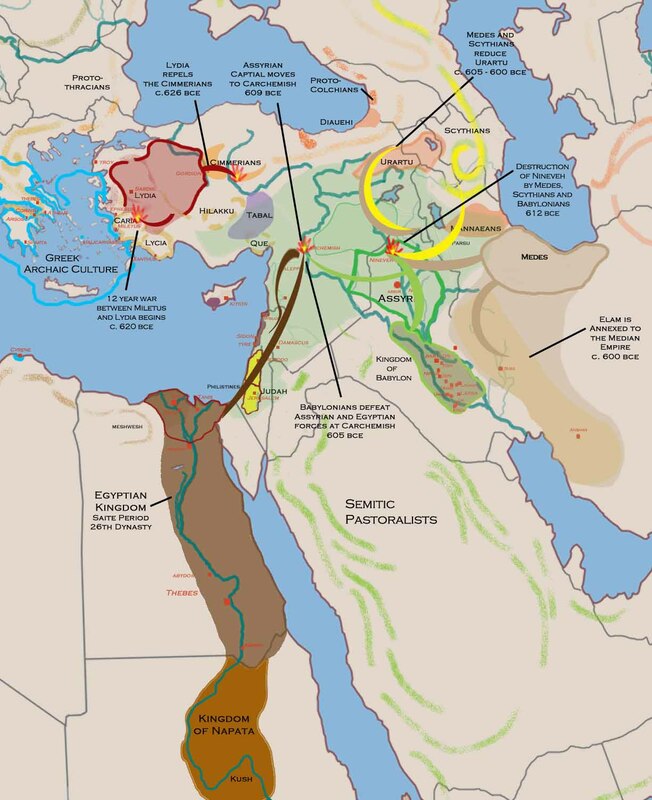 Map showing the Fall of Assyria 634-600 BCE ©Copyright 2015 AMSC Research, LLC. In a recent project, AMSC Research studied over 5000 years of human history in the Mediterranean basin and converted this information into more than 75 maps. This project formed the outline for an animated history of conflict now on display in a Midwestern museum. This type of cartographic research is one of our strengths. Mapping is, in our view, vastly underused despite the fact that such geographical imagery is essential to enriching the educational mission of many institutions. Maps have the power to explain otherwise confusing historical data and are a primary means of bringing a vanished past to life. Cultural information of all types is clarified through the use of these kinds of explanatory diagrams. 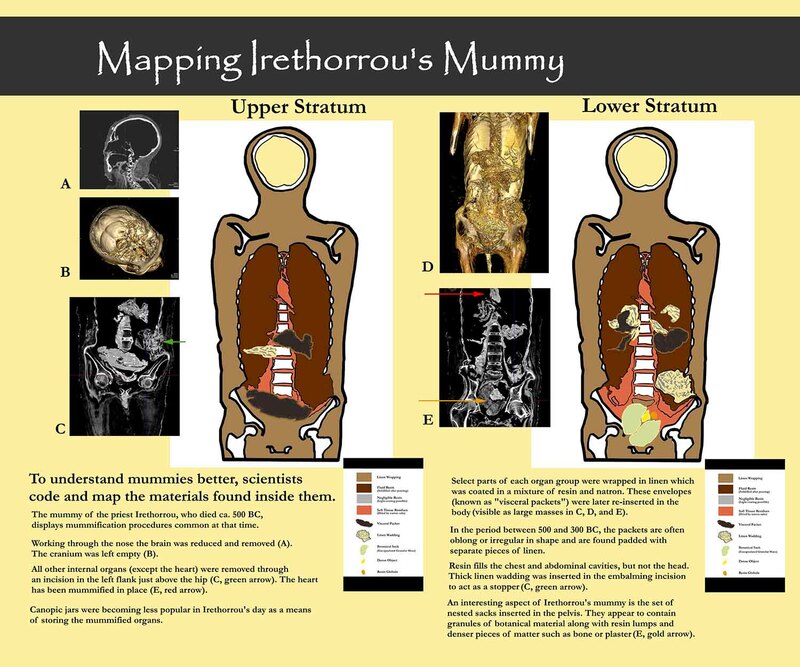 We have even used a "cartographic approach" to represent the complexities of Egyptian mummification. In this example, the often bewildering array of slices created when CT scanning a mummy was distilled into an easily translated layer-by-layer diagram keyed to photographs from the scan. "Mummy Mapping" diagram ©Copyright 2015 AMSC Research, LLC. Because of our ability to research image-related questions efficiently, projects of this type are extremely doable in short timeframes. Our consultations are done remotely in most cases so that elegant and meaningful graphic representations can be produced very cost effectively. Let us help you get to the heart of the matter through careful research and design. To request a consultation, email us at: director@amscresearch.com. ©Copyright 2015 AMSC Research, LLC.